The city academies programme in England is succeeding, driven along by "parent power", Tony Blair has said. The government wants 200 of the state-funded, independently run schools to raise standards in poorer areas in place or under construction by 2010. Former Education Secretary Estelle Morris said the policy could hinder the aim of raising overall standards. However, Shadow Education Secretary David Cameron backed academies, saying the scheme had "not gone far enough". He said: "Real autonomy means letting heads take control of decisions over the curriculum, admissions and ethos of the school. "To date, the academy programme has not gone far enough. What is needed is real rigour combined with autonomy in schools." 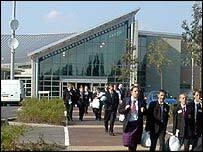 Under the scheme, schools are demolished and replaced with "state-of-the-art" buildings at an average cost of £25m. The idea has been controversial because to become an academy a school must raise up to £2m from private sponsors, who are given a major say in the curriculum and the academy's general running. Mr Blair said the proportion of pupils receiving the equivalent of five good GCSEs had risen in academies by eight percentage points last year, which he said was four times the national average. The Department for Education and Skills was not able to say what the academy results underlying this change had been, or to give the national average - which has not yet been published. A spokesman said later Mr Blair's comparison was a conservative one, based on an estimate of what the national improvement this year might be. Academies had probably done even better, relatively. Will choice and market forces once again squeeze out the children of the disadvantaged? Mr Blair said: "It's about fairness and opportunity for everyone, regardless of the background or class, or religion, or race they come from." All parents wanted to do their best for their children, even if this meant moving to a catchment area for a good school. Mr Blair said: "I never blame any parent for doing the best for their children." But it was time for their preferences to "shape the system". Mr Blair said the government was on track to meet its 2010 target for academies, and would have 40 in place by next September. Earlier, Ms Morris told the Guardian newspaper "another round of structural change" would not by itself achieve universally high standards. "Worse than that, it could be a distraction. In five years' time, whose children will be going to these new academies? "Will choice and market forces once again squeeze out the children of the disadvantaged?" Mr Blair quoted a survey by PricewaterhouseCoopers, published in June, suggesting nine out of 10 parents of children at the existing academies were satisfied with their education. But the Education Network, which advises local education authorities on raising standards, later said the government's interpretation of the figures was "misleading". Mr Blair also countered arguments that academies are excluding the poor, by saying the number of children receiving free dinners at the new schools is nearly twice the national average. Mary Bousted, general secretary of the Association of Teachers and Lecturers, said: "There is no proven 'academy effect', but there are real concerns about the undue level of control handed to unelected, largely unvetted individuals or businesses. "There is an astonishing lack of public accountability and a lack of openness across the academies programme despite the large amount of public funds going into each academy."